Looks like Pushing Daisies and Eli Stone will have Kings for company this summer. I sat down tonight to watch the new episode of Kings, "Brotherhood", only to find myself looking at a rerun of Law & Order: SVU. The local TV guide said it would be there. IMDB said it would be there. Unfortunately, NBC decided Kings didn't perform well enough in its one showing on Saturday, so they shuffled it off to summer oblivion. Saturday night is typically a dumping ground for reruns, so why do they care what the ratings are? I can bet a decent portion of people hoping to tune in to Kings last week did so on Sunday. Whenever a show switches timeslots, it takes people a week or so to catch up. Now we tune in on Saturday, and the show is gone. So, after a mere five episodes, we have to wait almost two months to pick up where we left off. I'm sure a two month layoff will really help the ratings come summer. Not that Kings has a chance of being renewed, the writing's pretty much on the wall at this point. It just seems that if you're looking for eyeballs for advertisers, you'd not want to lose the diehard audience Kings does have by shutting them out for a long hiatus. Really, NBC never gave Kings a chance. The promos were too vague, and once the big hype was done, there were few commercials airing for the show. Kings' original Thursday timeslot was given to Southland, and Kings was pushed to Sunday. And then to Saturday. And then to nowhere. A commenter on TV Series Finale blames it on a change in NBC management. I wouldn't be surprised at all if politics were involved, because purposely killing an expensive and ambitious show before it's even begun? That's more spite than sense. The glorious Kings will return on Saturday night, June 13, at 8/7c. You can always refresh your memory when the time comes with my blog on episode 5, "Judgment Day". In the meantime, NBC offers you Saturday reruns of Law & Order: SVU, Southland, and Law & Order. Because, you know, we don't get enough of cop and lawyer shows the rest of the week. 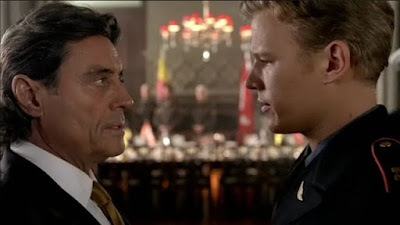 PHOTOS: Ian McShane as King Silas, Christopher Egan as David Shepherd, Susannah Thompson as Queen Rose, and Sebastian Stan as Prince Jack on Kings, screencaps c2009 UMS, NBC.